Dogfish Head Lupu-Luau IPA is up today. The story which led to the development of this beer is funny. But basically this is a coconut forward IPA brewed with experimental hops. 7.3% alcohol. 45 IBU. Tangerines, tangy and juicy, and plenty of coconut fill your nose. Similar flavors, starting very juicy and tangerine fruity. And there is no mistaking the tons of coconut that was used. 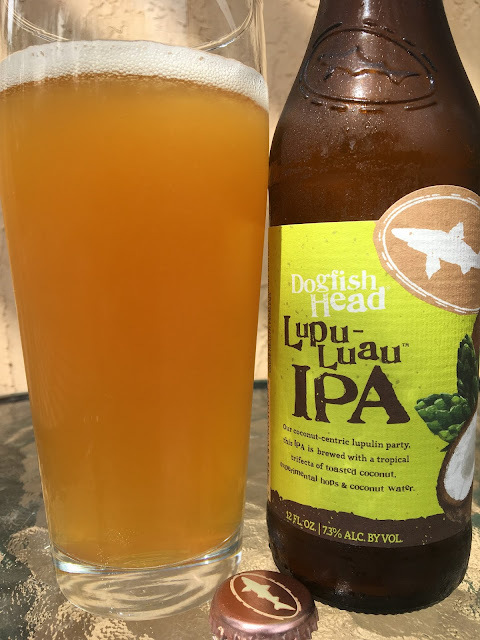 Nicely bitter, super tangy, hints of vanilla dodge in and out of the coconut flavors, which by the half bottle mark have asserted themselves extensively. That coconut flavor just keeps growing to the point of "please, no more" by the end of the bottle. I liked the flavors but the coconut was overdone. Another interesting beer. Check it out and let me know what you think.